I was driving late Tuesday night, heading home from seeing some friends. The lights were soundless as they came up behind me. I’d had a beer, and I pulled over and worried for a moment as the lights carried on past me into the night. Ahead of me, more lights flew by soundlessly, then more. As I pulled to the curb in front of my house, the first siren split the humid night air, and yet another set of lights burned down the road. Let’s go back to 2006 and meet George Nickel. He’s been in the US Army a long time- he was a private in the Hawaii-based 25th Infantry back when the Tropic Thunder division still had an Air Assault regiment. When I met him, he’d already left the Army and come back to join the Army Reserve with friends of his from his work at Idaho’s State Penitentiary. He’s given this country of ours a lot. On February 8th, 2007, on a narrow road outside of Karma, Iraq, Staff Sergeant Nickel, USAR, very nearly gave it all. He was the lone survivor from the explosion of one of the largest IEDs ever placed in Iraq- his 12 ton bomb-resistant vehicle was thrown above the tops of the 10-foot high reeds that lined the road. Three other good men died- the truck’s gunner, just a foot away, was blown from the turret and died before he hit the ground. The sergeant riding shotgun was even closer to George- he too died instantly. The driver was the furthest from the point where the blast penetrated the armored hull- he lived long enough for a medivac helicopter to arrive, but he died en route to the combat hospital in Fallujah. George Nickel was separated from death by mere inches. Nearly every bone on the right side of his body was broken, and shrapnel from the blast tore his flesh. George was a private man. He was the sort to get married to a woman, and only tell his best friends, the ones he had rejoined the Army with, when they noticed the ring he was wearing. 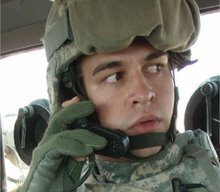 Everyone who deploys overseas has a contact number on file, so if the worst happens, the military can begin the process of alerting loved ones of their service member’s death or injury. George gave the Army a number that he knew his wife wouldn’t answer, trusting his friends to tell her before the Army found her. In the end, that was exactly how it happened. He arrived from Germany at Walter Reed Army Medical Center just after the neglect scandal broke there. There wasn’t enough room for him; the administration there wanted to send him home to continue his rehabilitation therapy. He was on canes then- his house was in the woods of Idaho, an hour from the nearest VA rehab facility, and definitely not handicap accessible. Instead, he was housed in one of the old hotels nearby that the Army had rented out to house the overflow of wounded warriors from Walter Reed. A cab took him to his temporary home- another wounded veteran helped him carry his meager belongings upstairs. He ate from care packages rather than trust the meal service. He finally came home to stay in Boise on July 4th, 2008. Fast forward to July 28th, 2009. Boise’s finest are running towards the sound of guns, and at the end they find George, still running toward the sound of his own guns. Towards his own demons. He’s lost his dog, and he’s searching the nearby apartments for the pup. A bullet into the lock. A boot into the door. Staff Sergeant Nickel is searching buildings, clearing rooms just like he did in Iraq. Suddenly there’s bright lights and a voice yelling “Police! Put your hands up!” He doesn’t. They start shooting, and he takes cover. Suddenly the war has come home for everyone, not just George. Trouble is, this is America and not Iraq, and in America we like to pretend that soldiers are GI Joes- like they’re heroes who never need our help. George is in a new world now- one where he is the 'perp' and not the hero, but in this new world he still needs our help more than ever. Edit: I rearranged the wording a bit in a couple spots and clarified a couple points. Welcome, Diggers, B5 readers, and everyone coming in off of other blogs and twitter! "This is bizarre behavior," Masterson said Wednesday. "I don't know what would push people to that (level of) desperation."